Born at Inverurie, son of sculptor William Ewan Macgillivray, he trained in the studio of William Brodie from age 13, and with ornamental plasterer James Steel in Glasgow, for whom he executed the interior decoration and carved an elephant on the Scotia Theatre, Stockwell Street (demolished). He later assisted John Mossman on his Campbell (1875-7) and Livingstone (1875-9) statues before becoming an independent sculptor. Occupying a studio at 112 Bath Street, he produced portrait busts of the 'Glasgow Boy' painter, Joseph Crawhall (1881), and the philosopher, Thomas Carlyle (1889). Macgillivray also produced a number of monuments in Glasgow's cemeteries which feature bronze portrait and figurative reliefs. These include the monuments in the Necropolis to Peter Stewart (1887); Alexander McCall (1888); Annie Greenhill (1889); Sir James Robertson (1889) and the Allan Family (1894-9, portrait relief lost). In Cathcart cemetery, he produced the monument to Margaret and Annie Brown, with a double portrait relief of the girls (1888), and in Lambhill Cemetery, the monument to the architect James Sellars (1890, bronze relief lost). As an architectural sculptor he produced figurative work for a number of important Glasgow buildings in the 1880s. These include the City Chambers, for which he carved the spandrel figures in the loggia (1886); the former Anderson's Medical College, 56 Dumbarton Road, for which he executed a tympanum relief group depicting the 16th Century physician Peter Lowe and his Students and a pair of winged figures (1888-90); and the statues of the Engineer and Shipwright on the former Fairfield's shipyard (1890). A painter, philosopher, musician and distinguished poet, as well as a prolific sculptor, he was a close associate of the Glasgow Boys and a co-founder of The Scottish Art Review. After moving to Edinburgh in 1894, he produced numerous busts and medallions for Edinburgh patrons and, in Glasgow: a bust to Rev. James Shanks, Maryhill Parish Church (1889, dem. 1998); and the medallions to Peter Lowe, Glasgow Cathedral (1893); Edward Caird, Glasgow University (1897); and Henry Drummond, Free Church College (1905). In 1902, he replaced W H Thornycroft as the sculptor of the portrait medallion for the Henry Drummond Memorial Drinking Fountain, Kelvingrove Park Gates, Park Terrace, which is now lost. Macgillivray also produced a report for the Scottish Education Department, which contributed to the establishment of Edinburgh College of Art, and became Sculptor Royal in 1921. His small-scale pieces are well represented in collections in Glasgow and Edinburgh, though his public works are rare. The most important of these are the statues of Robert Burns, Irvine (1895); Lord Byron, Aberdeen; the 3rd Marquess of Bute, Cardiff; John Knox, Edinburgh; and the multi-figure monument to William Gladstone, Edinburgh (1902). His architectural work outside Glasgow includes sculpture on Dumfries Public Library (1904). Macgillivray died on 29 April 1938, and was buried in Gogar Kirkyard, Edinburgh, his grave marked by the monument which he sculpted for his wife, Frieda, who died in 1910, and which incorporates a bronze portrait of her by her husband. 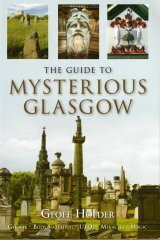 The team at glasgowsculpture.com are grateful to Caroline Gerard for information on Macgillivray's grave, and for the permission to reproduce her photograph of his monument in Gogar Kirkyard. Caroline Gerard: information and image of Macgillivray's grave.